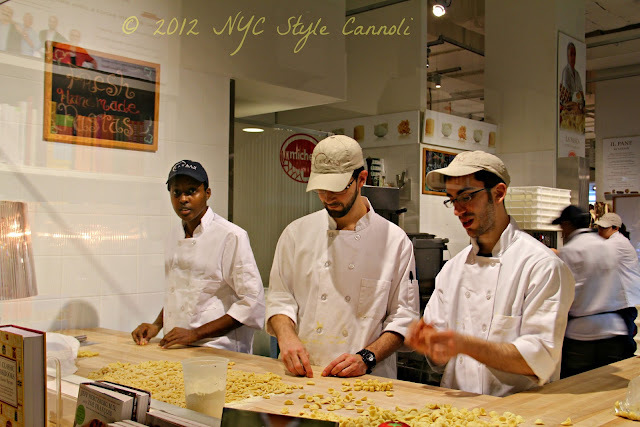 Photo Gallery Thursday "Making Pasta at Eataly"
I just LOVE Eataly...it may be one of my favorite places in NYC. We have a little mini version near me (also Mario Batali - called Tarry Market) and I go every chance I can get! Gnocchi is a good one but I am a sucker for any type of ravioli - it's so versatile and can be stuffed with anything from rabbit or boar to spinach and goat cheese. And the sauces! The combinations are really endless. I visisted Eataly in summer of 2012 and I absolutely love it! Such a cool place for any foodie. I waited until 2012 to visit Eataly and sorry I did not sooner but what a FAB place! Selection is just amazing! !